Nucleus Connect is Singapore’s Operating Company (OpCo) for the active infrastructure of the Next Generation Nationwide Broadband Network (Next Gen NBN), a pervasive and sophisticated all-fibre optic network to every home and business. The company plays a key role in spearheading the development of a vibrant service creation eco-system for our Service Providers. Harnessing the power of pure fibre optics, Nucleus Connect sets to skyrocket Singapore into a new digital landscape by providing our Service Providers with services that help them offer infinite interactive and multimedia possibilities to businesses and consumers. Our high speeds of up to 1Gbps mean on the business front, companies will be able to enjoy a wide variety of services such as seamless cloud computing and collaboration, as well as high-definition multi-feature video-conferencing like never before. On the home front, consumers can expect a higher quality of life with services like Internet Protocol Television (IPTV) and ultra high-definition video streaming, as well as e-education and smart home appliances. Nucleus Connect transforms the way of how families and business partners can connect to one another. Our fair and transparent practices and services empower consumers and businesses alike, to navigate this new digital landscape, and unlock new opportunities. The sky is the limit with our flexible, open platform for innovation. We power a vibrant infocomm eco-system with the Next Generation Nationwide Broadband Network enabling retail service providers, application/content developers, and consumers to connect to new opportunities, possibilities and innovations supported by our commitment to innovation, service excellence, fairness and trustworthiness. Nucleus Connect’s values define the way we work. 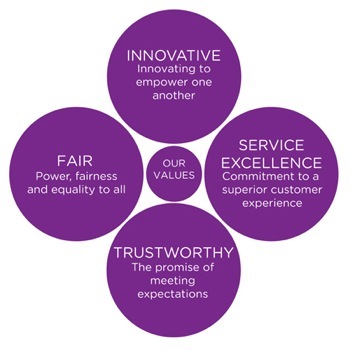 Each of these values expresses a key facet of what we believe in and what we commit to our customers. StarHub is Singapore's fully-integrated info-communications company, offering a full range of information, communications and entertainment services for both consumer and corporate markets. StarHub operates a mobile network that provides 4G, 3G and 2G services. It also manages an islandwide HFC network that delivers multi-channel pay TV services (including HDTV, Internet TV and on-demand services) as well as ultra-high speed residential broadband services. StarHub operates an extensive fixed business network that provides a wide range of data, voice and wholesale services. Over Singapore’s fibre-based Next Generation Nationwide Broadband Network, StarHub offers a broad range of home and business broadband plans along with a host of advanced media-rich value-added services, such as IPTV for commercial entities.